Forgive me. I’m a sucker for a dumb joke and you gotta figure quotes about toast are few and far between! 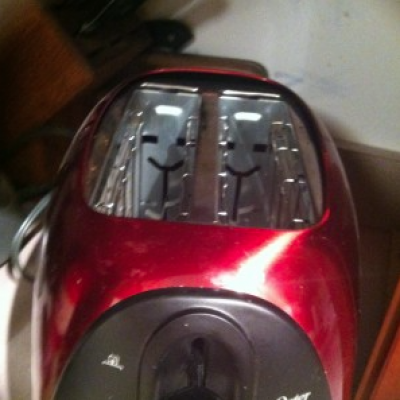 BTW, I hope you notice, today’s picture is of Twin Smileys, one in each slot of the toaster. See my all time favorite Toast Smiley, over on a Month of Smiley Silliness, in honor of this day celebrating the Toaster! Today we say happy birthday to Vincent Price, (1911), Chris Colfer (1990), Louis Gossett, Jr. (1936), Jamie Oliver (1975), and Isadora Duncan (1877). Tonight’s fantasy dinner party can be prepared by birthday boy Jamie, a.k.a. the Naked Chef. Additionally, it’s the anniversary of the opening of the Golden Gate Bridge. We did something midspan of this bridge, which probably has never been done before or since. Can you guess? Here are a couple goofy ones. Today is both Cellophane Tape Day and Sunscreen Day. Funny, but shouldn’t the latter have gone along with yesterday‘s Don’t Get Fried Day? As is often the case, the Toast Smiley you get in the Smiley-a-Day emailer is different from what you see here.